Thanks to stunning beauty of nature Yangtse River run through Three Gorges was an inspiration for Chinese poets and painters. Today it amazes tourists taking epic Yangtze River cruise and visiting Three Gorges Dam. For some the area of Three Gorges was a birthplace and homeland to which they dedicated their whole lives. For others, just “passing by” - Three Gorges was an unforgettable place for long cherished in their memory. And for most of those having chance to be there even once in their lifetime, it was a place where unleashed wild power of nature has been competing for attention with the scenery of stunning beauty…. Place of inspiration, place where the imagination could easily take over the reality…..
Qu Yuan (living around 300 BC) considered as the most prominent poet of Chinese Romanticism was born in Lepingli next to Xiling Gorge (Zigui County). His poems with many of them dedicated to Yangtze are widely respected throughout the world. Li Bai (701-762 AD) regarded as one of the greatest poets of China’s Golden Age wrote the following poem when sailing down the Yangtze River through the area of Three Gorges. (The poem reflects Li Bai's emotions leaving the town of Baidicheng after being freed from politically motivated imprisonment). ....This morning, I depart the town of Baidi engulfed by vibrant clouds. I return to far away Jiangling within a single day! From both banks, the steady sound of shrieking monkeys fills the air. Similarly many other literary men from the Pantheon of Chinese Poetry like Du Fu, Liu Yuxi, Fan Chengda … left their immortal poems behind, some engraved in beautiful Chinese calligraphy on the cliffs along the Yangtse River. But it may be surprising to learn that one of meaningful poems about Yangtze was written back in 50’s by Chairman Mao Tse-Tung (Zedong). It is not well known, but Mao received good education in classical literature and his early poems are highly regarded even by today’s scholars. The inspiration for the poem came after his swim in the waters of Yangtse. I care not whether the wind blows or rain falls. This is better than sauntering in quiet courtyards. Today I enjoy my leisure. Making a pathway over sky and waters. And Wushan's clouds and rains. A smooth lake will appear over the high gorges. Reading the poem you may realize that in a way Mao predicted construction of the dam (Stone Walls) on Yangtze in the area of Three Gorges. Regardless of how today one can judge Mao’s achievements and failures, we can say that on top of being good romantic poet he was also an excellent swimmer….. Frankly swimming across Yangtze is not a joke…. 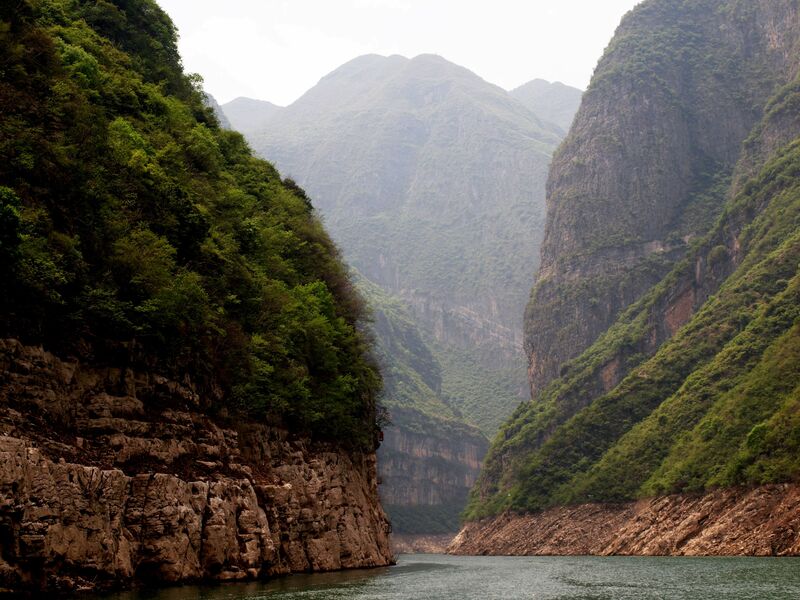 Yangtse River (Shennong Brook gorges): Rainy and foggy climate makes it a fertile land for plants, paradise for animal species (especially yellow monkeys and birds) and difficult territory for humans. It seems that these days Mao does not have many followers swimming across the Yangtze River. Instead, there are plenty of tourists taking cruise between Chongqing and Yichang along the fabulous area commonly called San Xia (Three Gorges).